Check out the Terence Toy App. NOW AVAILABLE in the Apple/Itunes App Store for Iphone, Ipad and Ipod. From your IOS device Just search “Terence Toy” in the Apple/Itunes App Store and for Android users (2.0 and above) search Terence Toy in the Android Market to find it. You can also scan the QR codes at www.terencetoy.com for easy access if you use a QR reader. The first 500 downloads are free. Why use the App? 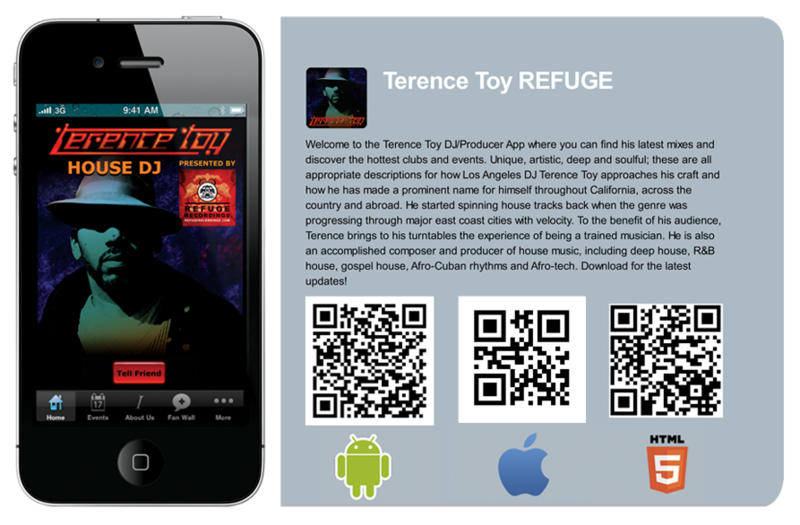 It’s the fastest and easiest way to access important Terence Toy and Refuge Recordings info and mixes – all from your mobile device. Inside the app you will be able to stay connected with event updates, mix information, streaming content, videos, photos, community activity and much more. Make sure to sign up for the Terence Toy Newsletter inside the app for exclusive content and giveaways that will not be available anywhere else. For smartphone users on other platforms (such as RIM/Blackberry/Web OS etc.) use the HTML 5 version in your smartphone browser to access the app. Go to www.terencetoy.com and scan the HTML 5 QR code to access the HTML 5 version. Sign up for the new email list below to be notified for Terence Toy’s exclusive content and giveaways that will not be available anywhere else.